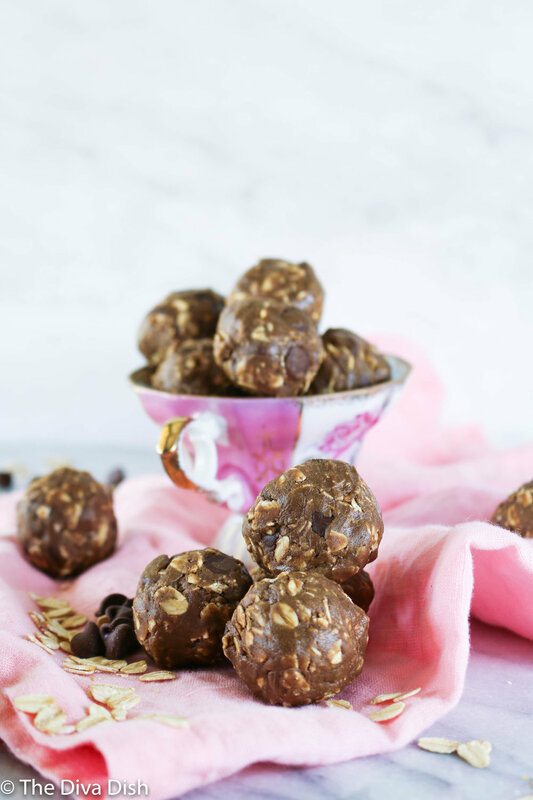 My girls love cookies and treats packed in their lunches, but I’d like to think these balls are equally sweet and delicious, while filling. Anything to keep my kids from coming home and eating everything in sight, right? 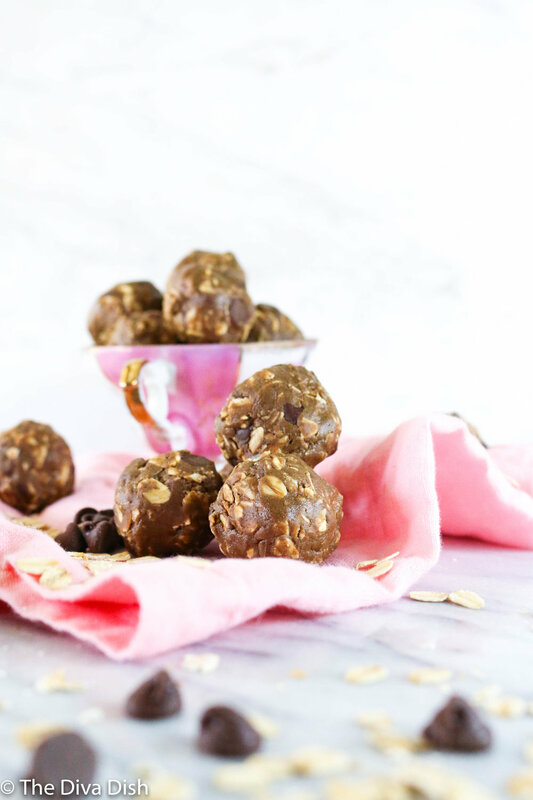 You could also switch up the flavors with different spices, protein powders, and nut butters! 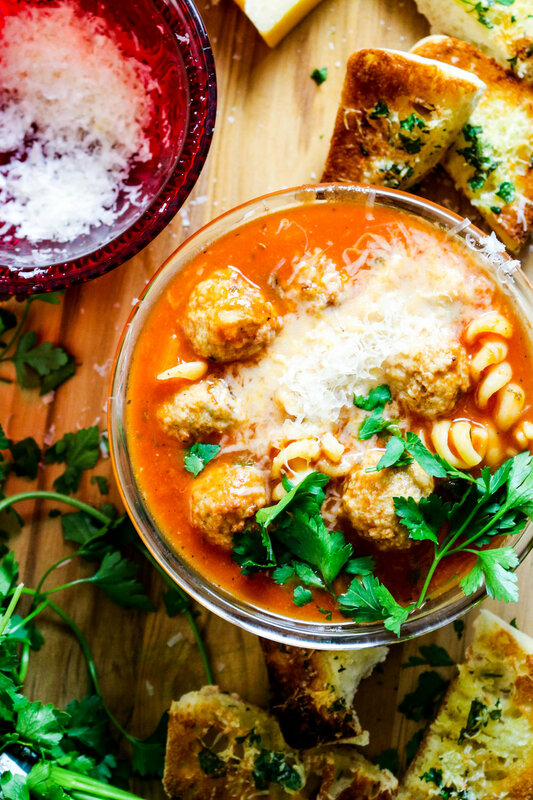 Add all ingredients into a medium bowl and mix together until combined. The dough will seem a little wet, but it will firm up once the oats start to absorb the liquid. 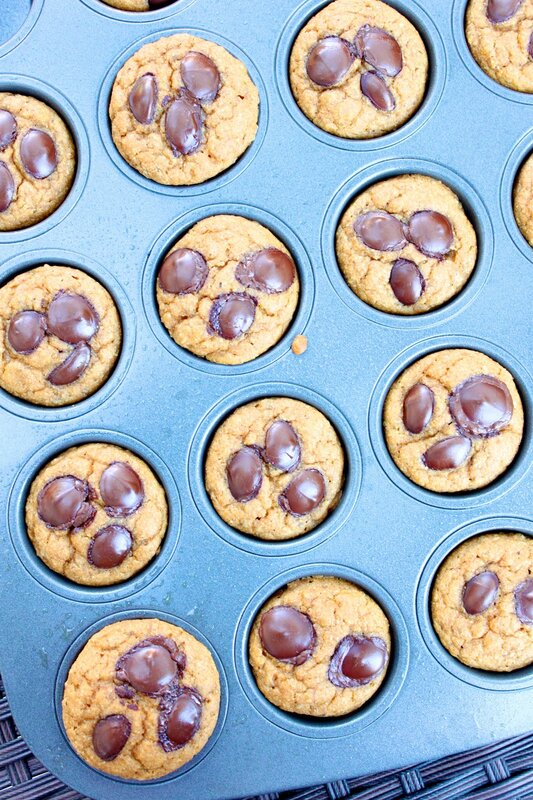 Next using a cookie scoop, form into balls. Place on parchment paper and let rest to firm up, about 5/10 minutes. Keep in a covered container until ready to eat. I like to store mine in the refrigerator. 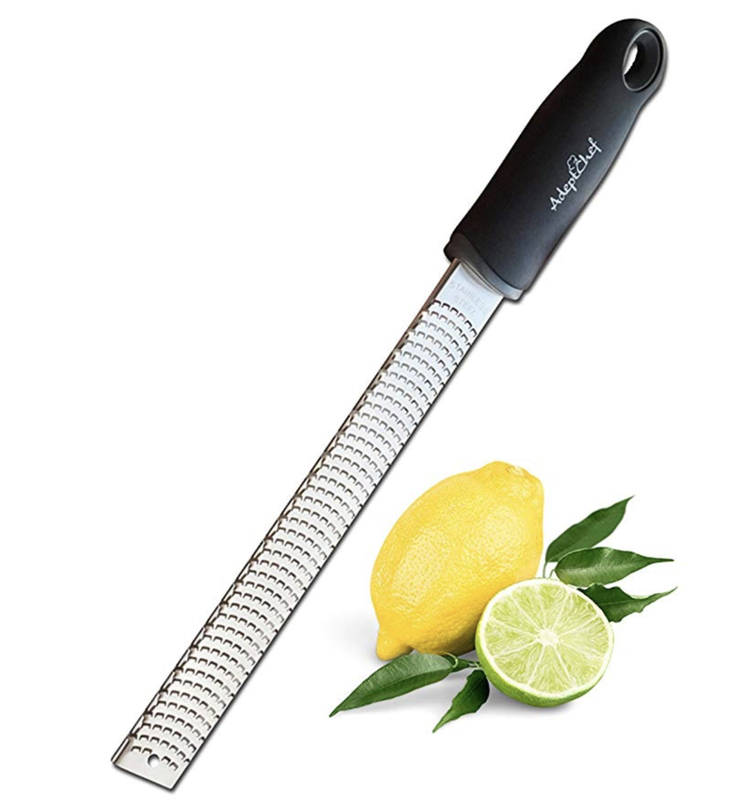 These links contain Amazon Affiliate links, which means The Diva Dish gets a portion of the purchased item. Thank you so much for supporting The Diva Dish! *Need a quick snack for your hungry littles, or even yourself? 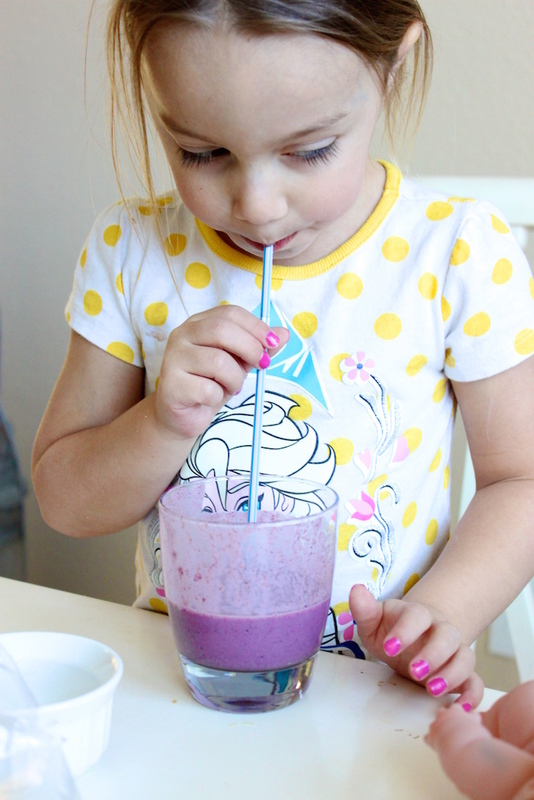 This Walnut Berry Smoothie is the perfect treat to keep those bellies full! * I've discovered over the past month that there is not only ONE but TWO places near my house that make Acai bowls. 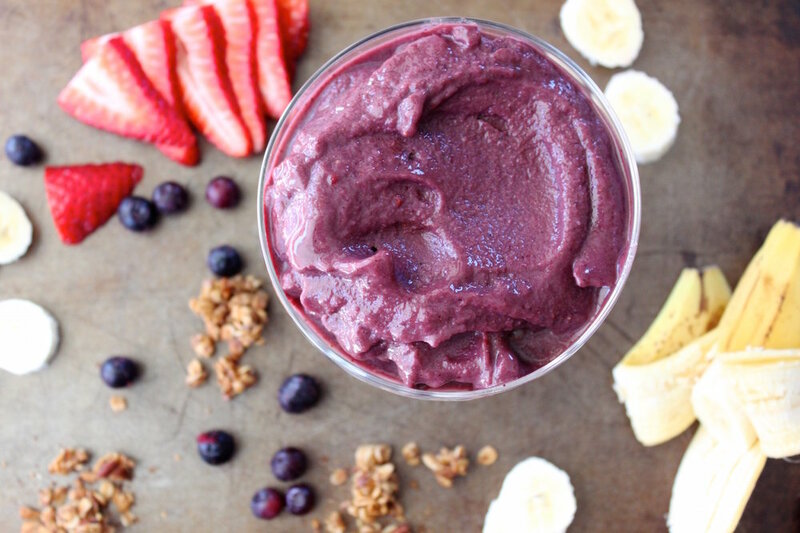 You know those smoothie bowls topped with fresh fruit, granola, and a drizzle of honey? I've been back and forth to both locations because I don't want to embarrass myself with how many acai bowls I'm really eating. Gosh dang...They are just so good. Unfortunately a regular bowl is just shy under TEN DOLLARS, and after 4 visits in a week your husband will start to question your insanity. I've tried to make my own acai bowl at home, especially since I used to make them in high school when I worked at a smoothie place...I'm like a pro. But by the time I go to the grocery store to buy the acai, my kids all of the sudden act like a pack of wild kangaroos raised them, I forgot my list at home, and the store feels like it's 115 inside and I begin to sweat profusely. And then I'm pregnant, so that basically means my mind is a bowl of spaghetti. NOW do you see husband?!? SO, I've been trying to make my own versions at home using what I have on hand LIKE A RESPONSIBLE ADULT...and I recently found a combination that I LOVE. Smoothies are such a staple in my household, we are basically addicted to them. They are just so quick and you can add whatever you want depending on how you are feeling. In this case, my girls asked for a pink smoothie, so I did my best and aimed to please. Sadly it was purple and they were pissed. Thank goodness for Princess Sofia the First and her purple obsession! Add all ingredients into a blender and blend until creamy. 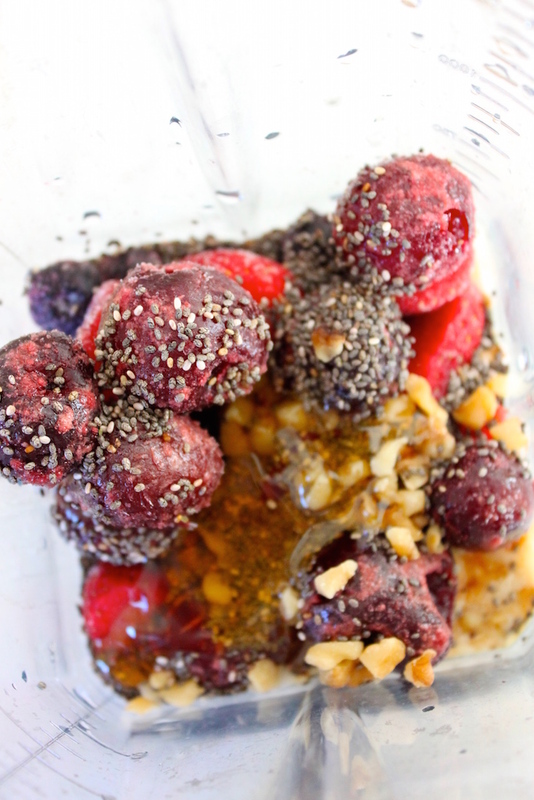 Optional: Top with your favorite toppings, like fresh fruit, granola, and a drizzle of honey! We are re-doing our downstairs in our home!! :) (Yes, we are having a baby in two weeks lol!) I know this isn't a DIY blog, but who doesn't love before and afters right?! We don't have the after just yet, but I do have really crappy before pictures! Yup! That's our fridge in our living room! I'm excited to show you the after! When my oldest started going to preschool, one of the things I was most excited about was packing her lunch. And maybe the break too. I loved the idea of packing her food that she would be excited about and all the other kids would be...I don't want to say jealous, but I kind of want to say jealous. Her first year of preschool when she initially started I remember going ALL out. Like cutting things in shapes, making themed lunches, and putting a lot of effort into her lunch. But then my youngest at the time was becoming more needy, life became more busy, and I just became too tired. 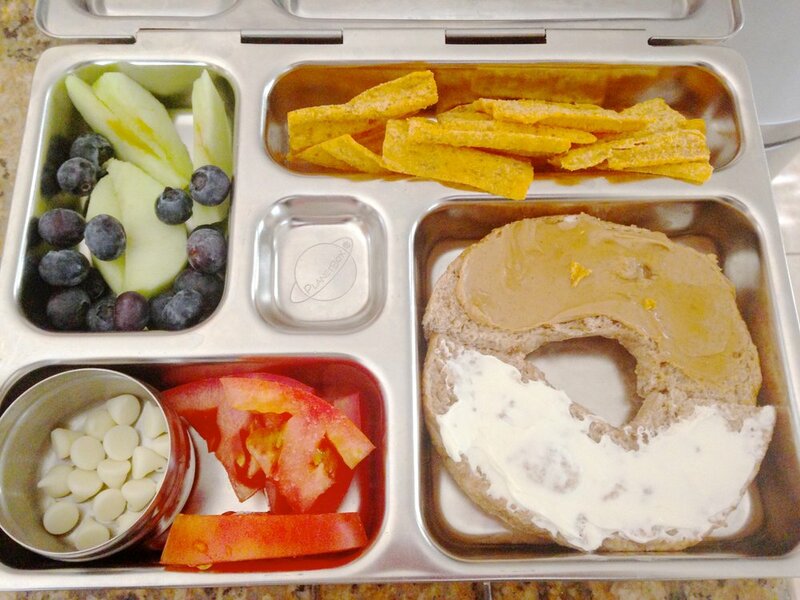 After that I had to have a realization with myself that her lunches didn't have to be fancy/time consuming (or PIN worthy), but they could still be quick, simple, healthy, and toddler approved. Fast forward to now I'm a busy mom of two with one on the way, which technically makes me a lot slower. I have a hard working husband and bags under my eyes. Most likely I haven't prepared anything the night before, and we are running late because a certain someone refuses to change out of the Elsa pajamas. So lunch prep has to be quick. My oldest is SUPER picky, so I try to appeal to her taste/preferences when she has lunch at school because I'm not there to monitor how much/what she eats. I try to add one new thing a week, just letting her slowly try different foods. I pack sweets. Some are homemade, and some aren't. She LOVES chocolate/which chocolate chips, so that's usually her 'treat'. Here are 12 lunches that I prepared at the start of this school year. Again, nothing fancy. 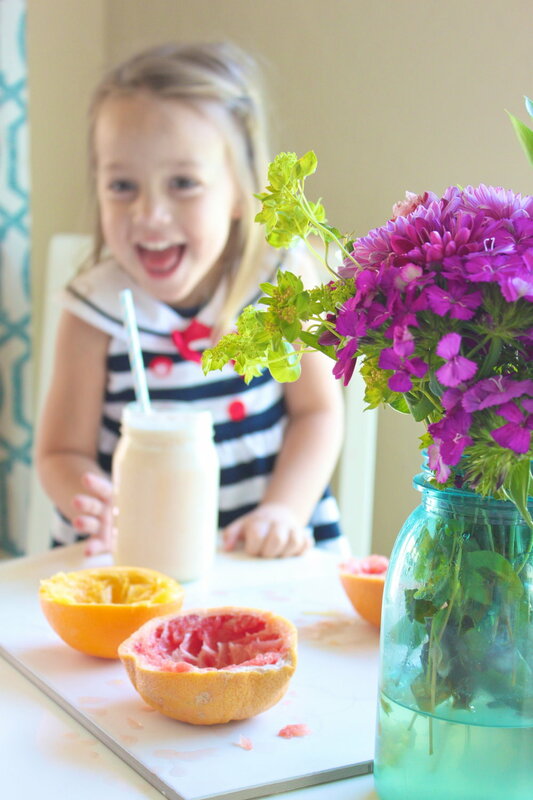 Just simple/quick/healthy/toddler approved. Like I said, nothing fancy :)! 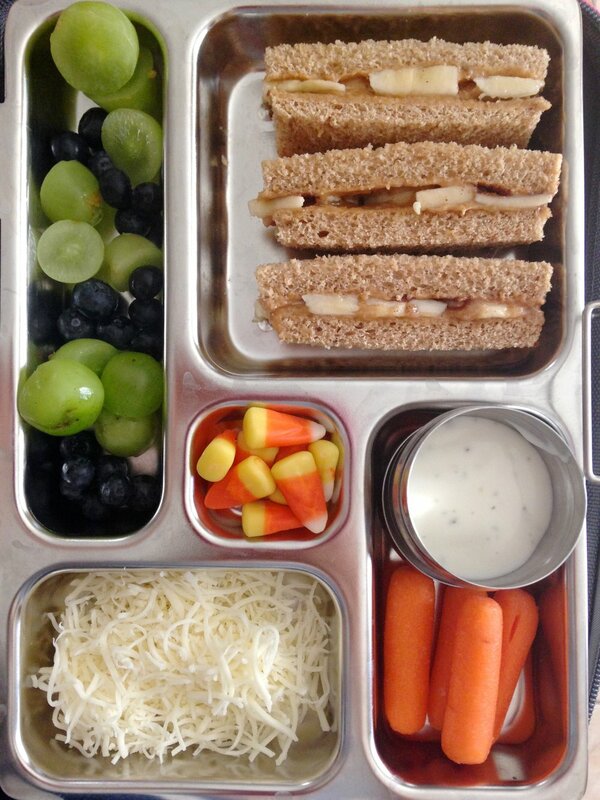 What do you pack your kids for lunch? This coming fall I'll be making two lunches, I'll definitely have to post more of those experiences because my girls have WAY different food preferences :)! Nothing's worse than making this huge dinner to have one person try it, and the rest of the family dabble at it. So glad I spent 45 minutes making dinner for everyone to not eat it. I've learned that effort is good when making dinner, but going all out crazy just isn't worth it. No matter how many sauces, dips, spreads, spices, and methods I used making that dinner, there is a chance that 50% will eat only a few bites. And then I feel bummed because all the work I put into dinner, so I finish off everyones plate to make up for it. So when it comes to dinner, I try and think simple. I remember that I have two kids under 3, and a husband that has the flavor palate of a 15 year old. I also usually try to stick with dishes that can easily be adapted for my kiddos. That means that I can take different parts of that dish and serve them separately to my one year old. For example, this pizza. I made it so I can serve her the chicken separately, along with the corn, and I can make a quesadilla out of the rest of the ingredients. The sauce is so easy that it took 2 minutes to make, just the way I like it! It's vibrant and green due to the cilantro and avocado, which goes perfectly for a mexican style pizza! I also added this in my girls quesadillas! Let's not forget about the "crust" in this pizza. It's garlic naan bread, which just took a few hours off my dinner prep. On days where I don't have the will or time to make homemade dough, naan bread is the perfect sub. It's fluffy and flavorful, and when you broil it in the oven it has a nice little crunch just like pizza dough would! Then there is my husband and I who have completely two different food preferences. So for my pizza, I opted for no cheese to keep it a little lighter. But for my husbands pizza, I added a little bit more chicken, lots or cheese, and a few dashes of hot sauce! After the pizzas are baked, I drizzled cold plain greek yogurt on top, which brings it all together! Make the dressing by combining all of the ingredients into a blender, and blending until creamy. Adjust salt/pepper to preferred taste. To make the pizza, get the naan bread. Spread the sauce on top of the bread. Then top with chopped romain, corn, diced tomatoes, diced peppers, cooked chicken, and if desired, cheese. Turn the oven on HI broil, and cook pizza for about 5 or so minutes, until the naan bread is a little crisp and the cheese is melted. This is what the girls dinner looked like. It wasn't as colorful, but they enjoyed it! Their quesadillas had cheese and the avocado sauce. Don't worry, tomorrow night I WILL serve peanut butter and honey sandwiches. There was a time when I went to Costco and bought a large sack of grapefruit because I was determined to loose 15 pounds. Then I read you could sprinkle a little sugar on top to take away the tartness. So I tried that. A sprinkle on top turned into a spoonful of sugar with each bite, and well the only thing that kick started that morning was my attention span. But if there is one thing I've learned in living a healthy lifestyle, it's that food that is healthy needs a partner. Like Kale. You wouldn't eat kale plain would you? I mean some of you might, that's ok...(no it's not.) But if you massage the kale with lemon juice, salt, and pepper and then roast it, it's delicious! Same thing goes for grapefruit. Pair it with a friendlier (and sweeter) citrus, along with the sweetness from the honey and the banana. Followed by the cream from a coconut (or greek yogurt), and next thing you know you are telling Orange Julius "Buh Bye!" Juice the citrus. Reserve 1/2 c. of the juice for the drink, and save the rest for drinking, smoothies, etc. Add the ingredients into a blender and blend until creamy. Seriously though, anyone need some grapefruit?